HomedigestCould there be life below Saturn's moon Enceladus and Jupiter's moon Europa? 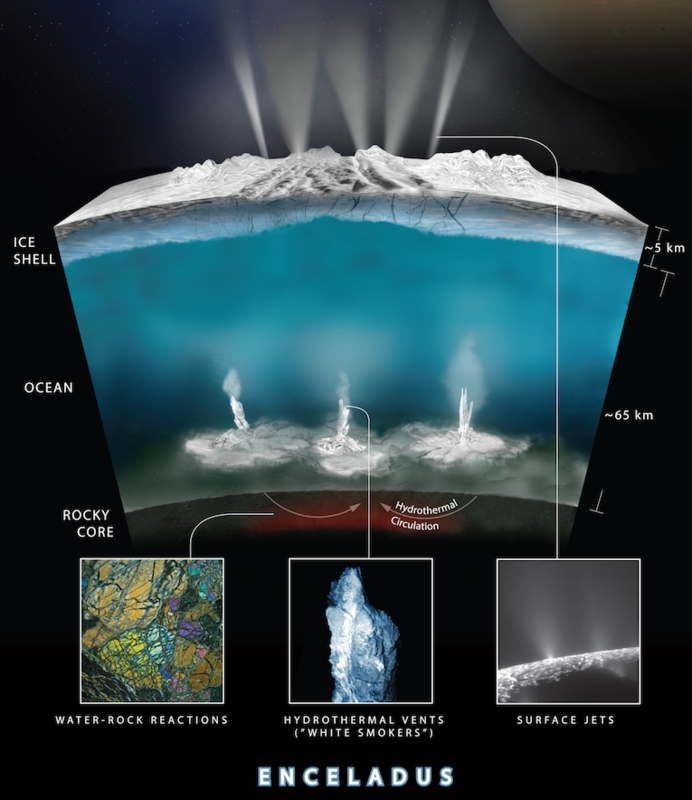 Could there be life below Saturn’s moon Enceladus and Jupiter’s moon Europa? Two NASA missions — Cassini and Hubble — have provided new evidence for life on icy, ocean-bearing moons of Saturn and Jupiter, NASA announced Friday, April 14, 2017. 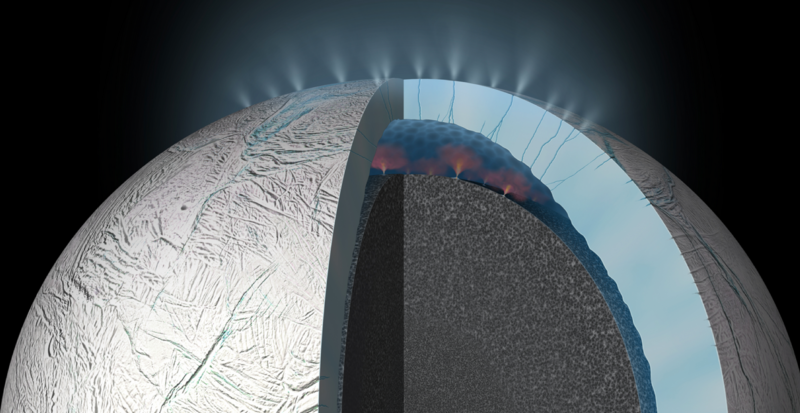 Scientists from Southwest Research Institute (SwRI) have discovered hydrogen gas in the plume of material erupting from Saturn’s moon Enceladus — suggesting conditions suitable for microbial life in an underground ocean. The finding, published April 14, 2017 in the journal Science, was based on analysis of data from NASA’s Cassini spacecraft. NASA also announced new Hubble Space Telescope observations of Jupiter’s moon Europa, reported in a paper published in The Astrophysical Journal Letters. A newly discovered plume seen towering 62 miles above the surface in 2016 is at precisely the same location as a similar plume seen on the moon two years earlier by Hubble. The scientists suggest this offers a promising location for study of Europa’s internal water and ice — and for seeking evidence of Europa’s habitability. Scientists hope to learn more with NASA’s Europa Clipper mission, planned for launch in the 2020s. It will feature a powerful ultraviolet camera that will make similar measurements to Hubble’s (but from thousands of times closer) and a next-generation version of the Cassini instrument. * NASA astrobiologists suggest that bacteria living in and around the dark hydrothermal vents extract their energy from hydrogen sulfide (HS) and other molecules that billow out of the seafloor. Just like plants, the bacteria use their energy to build sugars out of carbon dioxide and water; sugars then provide fuel and raw material for the rest of the microbe’s activities. But instead of photosynthesis, the microbes derive their energy from chemicals in a process called “chemosynthesis”: Hydrothermal vents extract their energy from hydrogen sulfide (HS) and other molecules that billow out of the seafloor. Recently, researchers have determined that fossilized evidence of bacteria from ancient seafloor hydrothermal vent-precipitates (found in the Nuvvuagittuq belt in Quebec, Canada) is at least 3.77 billion years old (or possibly as much as 4.28 billion years old). The minimum age of the fossils would make them the oldest indication of life on Earth so far. Saturn’s moon Enceladus has an ice-covered ocean; a plume of material erupts from cracks in the ice. The plume contains chemical signatures of water-rock interaction between the ocean and a rocky core. We used the Ion Neutral Mass Spectrometer onboard the Cassini spacecraft to detect molecular hydrogen in the plume. By using the instrument’s open-source mode, background processes of hydrogen production in the instrument were minimized and quantified, enabling the identification of a statistically significant signal of hydrogen native to Enceladus. We find that the most plausible source of this hydrogen is ongoing hydrothermal reactions of rock containing reduced minerals and organic materials. The relatively high hydrogen abundance in the plume signals thermodynamic disequilibrium that favors the formation of methane from CO2 in Enceladus’ ocean. Abstract of Active Cryovolcanism on Europa? Evidence for plumes of water on Europa has previously been found using the Hubble Space Telescope using two different observing techniques. Roth et al. found line emission from the dissociation products of water. Sparks et al. found evidence for off-limb continuum absorption as Europa transited Jupiter. Here, we present a new transit observation of Europa that shows a second event at the same location as a previous plume candidate from Sparks et al., raising the possibility of a consistently active source of erupting material on Europa. This conclusion is bolstered by comparison with a nighttime thermal image from the Galileo Photopolarimeter-Radiometer that shows a thermal anomaly at the same location, within the uncertainties. The anomaly has the highest observed brightness temperature on the Europa nightside. If heat flow from a subsurface liquid water reservoir causes the thermal anomaly, its depth is ≈1.8–2 km, under simple modeling assumptions, consistent with scenarios in which a liquid water reservoir has formed within a thick ice shell. Models that favor thin regions within the ice shell that connect directly to the ocean, however, cannot be excluded, nor modifications to surface thermal inertia by subsurface activity. Alternatively, vapor deposition surrounding an active vent could increase the thermal inertia of the surface and cause the thermal anomaly. This candidate plume region may offer a promising location for an initial characterization of Europa’s internal water and ice and for seeking evidence of Europa’s habitability. W. B. Sparks,, B. E. Schmidt, M. A. McGrath, K. P. Hand, J. R. Spencer, M. Cracraft, and S. E Deustua. Active Cryovolcanism on Europa? The American Astronomical Society. The Astrophysical Journal Letters, Volume 839, Number 2. April 13, 2017.